Attending a conference and running a booth are completely different experiences. 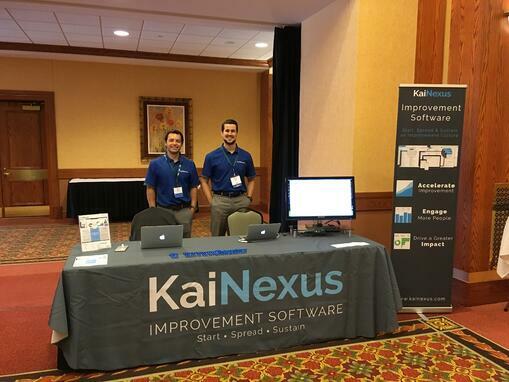 The KaiNexus team frequently attends conferences - maybe you saw us this year at the Iowa Lean Consortium, the Lean Construction Institute, and the Lean Healthcare Transformation Summit to name a few - to learn more about Lean and support our customers attending these events. A couple weeks back, the KaiNexus team pulled double duty and attended the Association for Manufacturing Excellence conference in Boston, MA and the Lean Construction Institute conference in Anaheim, CA in back-to-back weeks. Our goals for the conferences were to see our current customers, learn from the speakers in breakout sessions, see how other vendors set up their booths, and meet as many people as possible. After the conferences were over, the KaiNexus team gathered together for a debrief. A debrief is a team gathering that discusses positives and areas for improvement after projects or events. In this debrief we discussed our goals heading into the conferences, what we believed our successes to be and how we can improve for future conference outings. We had hundreds of conversations with Lean and improvement professionals from around the globe and generated more interest in KaiNexus than we expected! We were able to support and learn from a handful our customers who presented at the conferences. We saw a number of ways that other vendors set up their conference booths and have already implemented changes to improve ours. When it was time to discuss what we could improve upon, we knew we were fortunate to have a certain continuous improvement software at our disposal: KaiNexus. The best part about coming up with Opportunities for Improvement (OIs) at the conferences was that they could be captured on the spot with the KaiNexus Capture app on our mobile phones. We knew that our OIs wouldn’t be forgotten - nor would they get lost on a piece of paper. We were able to find all our improvements during our debrief based on the “Conferences” label that each was tagged with. Each team member could then discuss their OI with the group to make sure the right person became responsible for making sure the improvement got implemented. The team created a new standard work document to solidify our feedback and plans for the next conference. Improvement professionals know that sitting down and debriefing after a project, event, or conference is important. Teams are able to highlight and celebrate positives and figure out how to do even better next time. Continuous improvement software such as KaiNexus gives everyone a way to easily participate, collect and group ideas, and gives visibility into the follow up of those ideas. Who knows how many OIs might have been left at the conference without it.